Valve clearance adjustment must be checked and adjusted, a) at the time of periodic inspection, b) when the valve mechanism is serviced, and c) when the camshafts are removed for servicing. Remove the cylinder head cover. Refer to “engine top side disassembly” in section 1d . Remove the spark plugs. Refer to “ignition coil and spark plug removal and installation” in section 1h . remove the valve timing inspection cap (1). 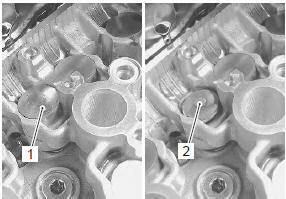 the cam must be at positions, “a” or “b”, when checking the valve clearance. Clearance readings should not be taken with the cam in any other position than these two positions. 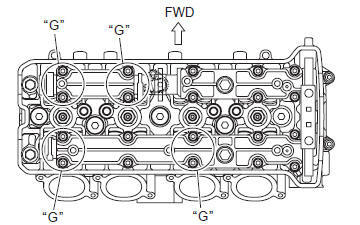 The valve clearance should be taken when each cylinder is at top dead center (tdc) of compression stroke. The clearance specification is for cold state. To turn the crankshaft for valve clearance checking, be sure to use a wrench, and rotate in the normal running direction. 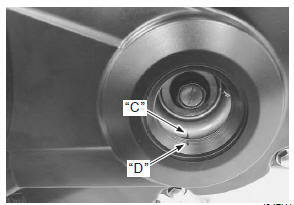 Turn the crankshaft to bring the line “c” on the ckp sensor rotor to the slit “d” of cap hole thread and also to bring the notches “e” on the left ends of both camshafts (ex and in) to the positions as shown. In this condition, read the valve clearance at the valves “f” (in and ex of no. 4 Cylinder, ex of no. 3 And in of no. 2). If the clearance is out of specification, adjust the clearance. 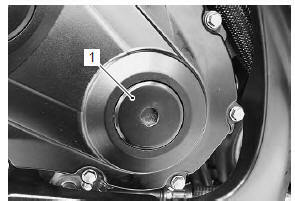 Turn the crankshaft 360° degrees (one rotation) to bring the line on the ckp sensor rotor to the rib behind the clutch cover and also to bring the notches “e” to the position as shown. Read the clearance at the rest of the valves “g” and adjust the clearance if necessary. The clearance is adjusted by replacing the existing tappet shim with a thicker or thinner shim. Remove the intake or exhaust camshaft. Refer to “engine top side disassembly” in section 1d . Check the figures printed on the shim. 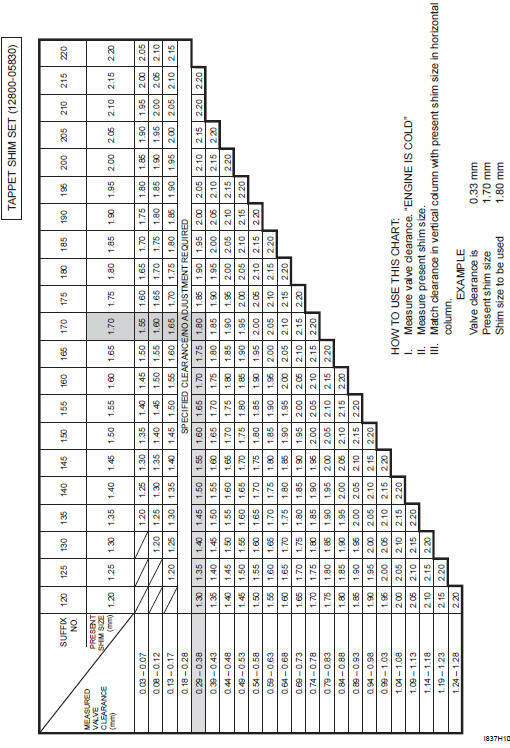 These figures indicate the thickness of the shim, as illustrated. Select a replacement shim that will provide a clearance within the specified range. For the purpose of this adjustment, a total of 21 sizes of tappet shim are available ranging from 1.20 To 2.20 Mm in steps of 0.05 Mm. Fit the selected shim (2) to the valve stem end, with numbers toward tappet. Be sure to check shim size with micrometer to ensure its size. be sure to apply engine oil to tappet shim top and bottom faces. Install the camshafts and cam chain tension adjuster. 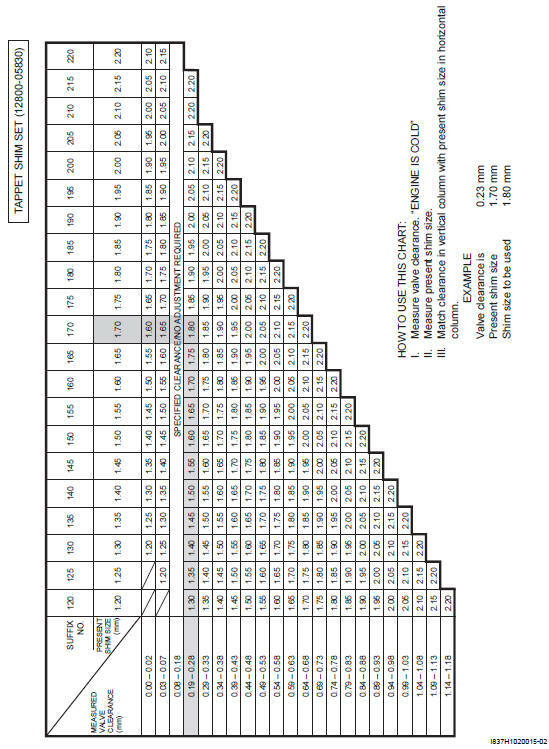 Refer to “engine top side assembly” in section 1d . Rotate the engine so that the tappet is depressed fully. This will squeeze out oil trapped between the shim and the tappet that could cause an incorrect measurement, then check the clearance again to confirm that it is within the specified range. After finishing the tappet clearance adjustment, reinstall the removed parts. 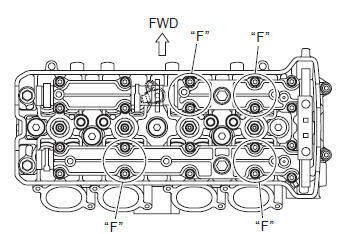 Refer to “engine top side assembly” in section 1d . 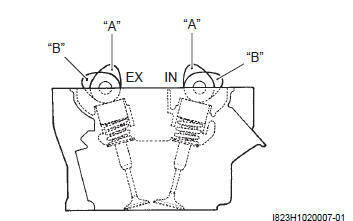 Refer to “ignition coil and spark plug removal and installation” in section 1h .